His gigs include Fabric, Ministry of Sound & Proud Camden to name a few & he’s also made appearances internationally in the likes of Ibiza & Cyprus. Paul was originally a DJ, playing at venues across the south east of England & spinning house, funk & soul but it was when bought his first set of hand drums that doors began to open. Now he can be found supporting DJs across London, the UK & beyond. As well as clubs, bars & festivals, he is equally happy playing at all manor of events from high end private parties to corporate parties events, Paul’s even been known liven up a champagne brunch party or two! 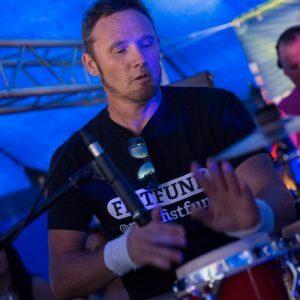 It’s always a privilege to welcome Fistfunk to Summer Soulstice over the past few years as he gives his all on those ‘skins’ for some 10 hours! The guy brings us an extra layer of excitement to the Club Tent vibe, banging those congas, bongos, cowbells & snares of his & we look forward to having him back again at our event on June 23rd this year. Let’s give the drummer some!